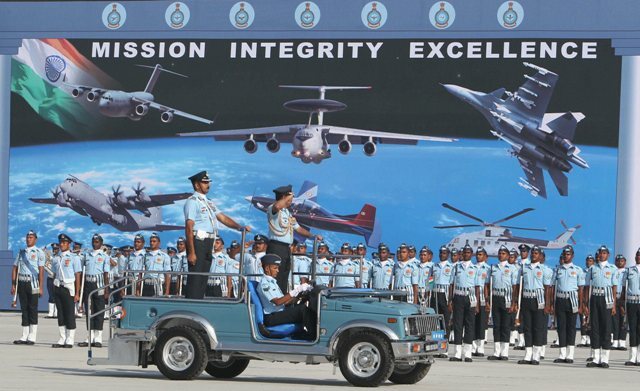 Air Chief Marshal NAK Browne reviews the parade during the 80th Air Force Day function at Air Force Station in Hindon on 08 Oct 2012. 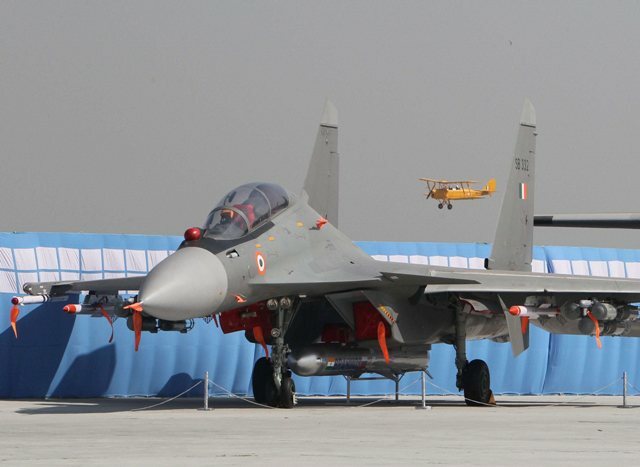 BRAHMOS missile integrated with Su-30 MKI on display during the 80th Air Force Day function at Air Force Station in Hindon on 08 Oct 2012. 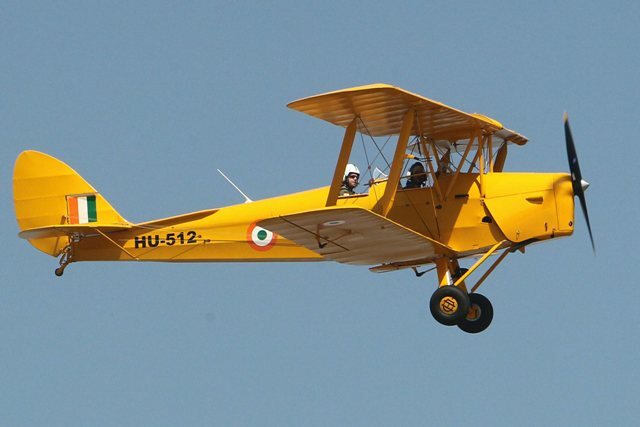 IAF's vintage 1930s Tiger Moth aircraft flying-past during the 80th Air Force Day function at Air Force Station. 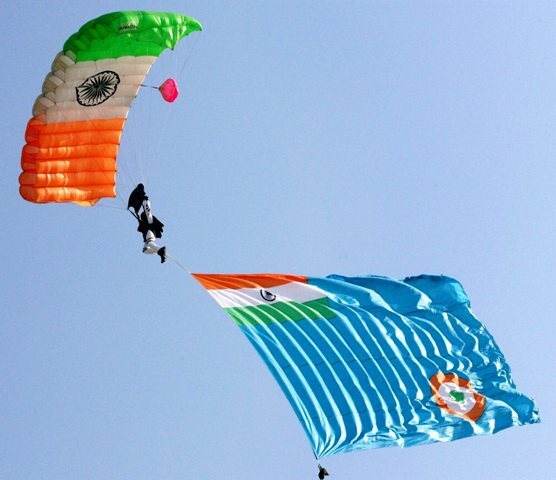 An IAF person carries the forces flag as he descends with a parachute during 80th Air Force Day function. 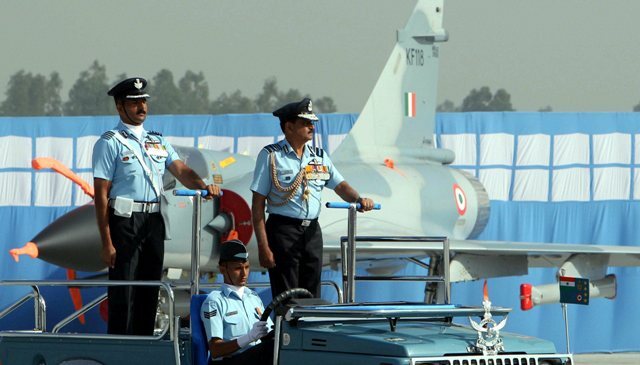 Air Chief Marshal NAK Browne reviews the parade. 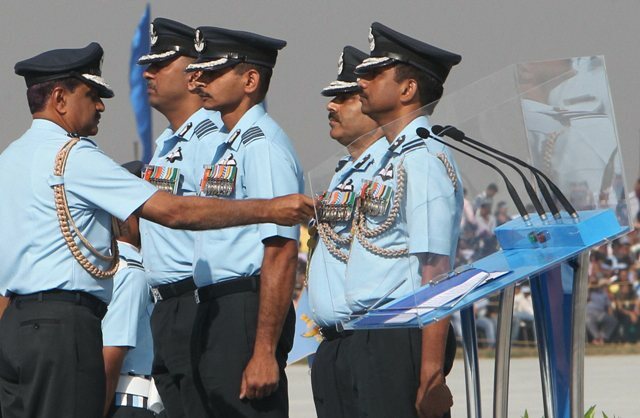 Air Chief Marshal NAK Browne honouring IAF personnel during the 80th Air Force Day function. 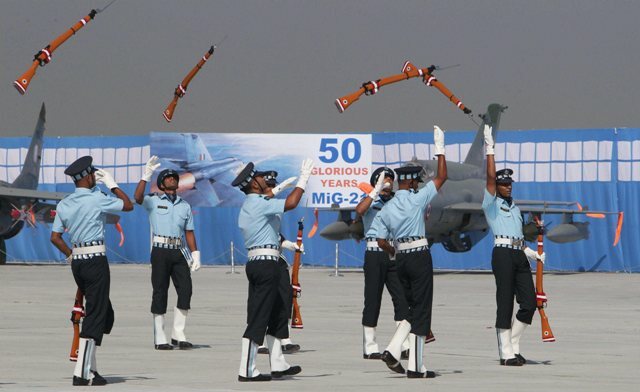 Air Force personnel perform with their guns. 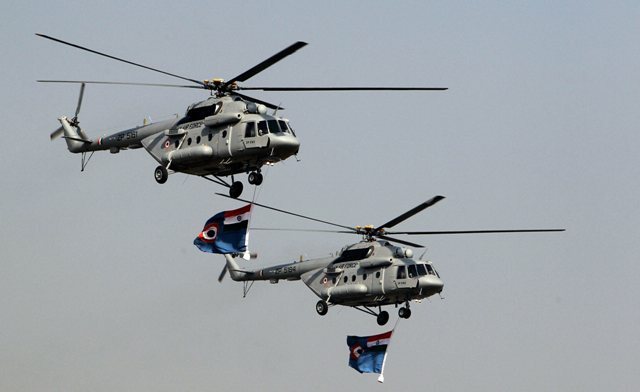 IAF personnel during the 80th Air Force Day function..
IAF helicopters presenting an air show during the Air Force Day celebrations in Hindon. 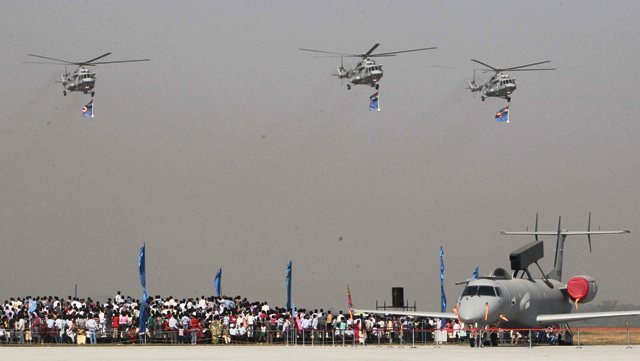 IAF helicopters performing during the Air Force Day function. 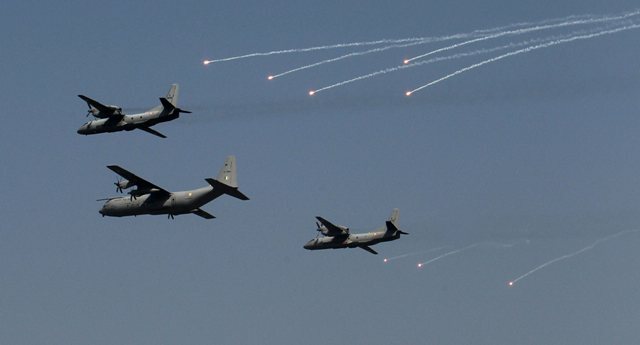 C-130J Super Hercules transport aircraft taking part in the aerial display along with other aircraft such as Su-30MKI, Mirage 2000, Jaguar, MiG-21 and AEW&C present during the Air Force Day. 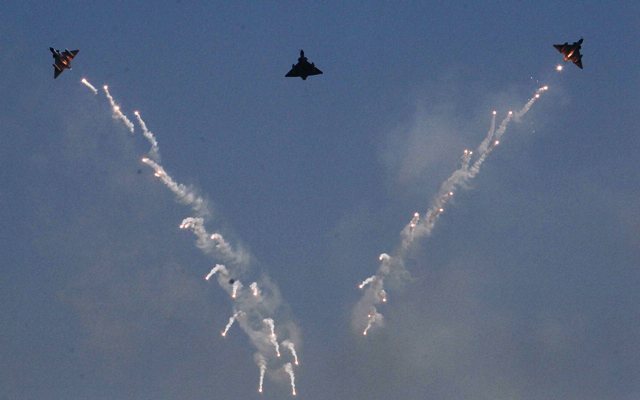 IAF's Mirage 2000 presenting an air show during the Air Force Day celebrations in Hindon.